Last year saw the launch of a series of collaborative shows between drone choir NYX and a number of other musicians. Joining them for the second instalment in the series was Gazelle Twin and above, you can watch a live video of the two performing the former's 'Deep England'. The original track features on Gazelle Twin's album Pastoral, which we named our favourite of 2018. In the clip above, you can hear and see the eight member-strong drone choir offer stunning accompaniment to Gazelle Twin's track. 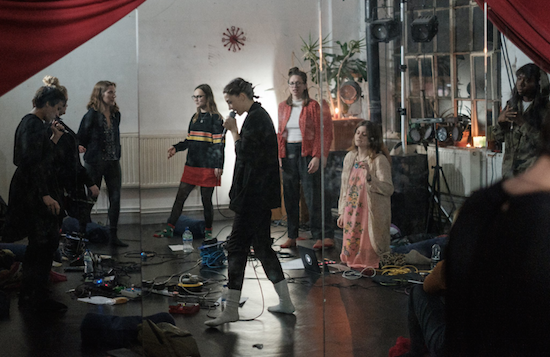 The collective is formed from trained opera singers, contemporary musicians and producers experimenting with collective and self sound manipulation, and is led by vocalist and composer Sian O'Gorman. This Sunday (February 3), they'll be joined by Optimo Music-affiliated Iona Fortune. You can find more information, and get tickets, here.